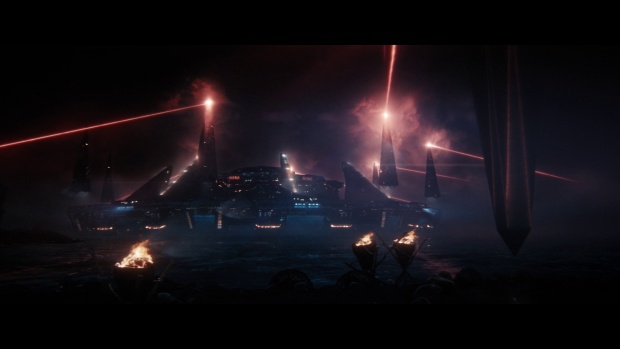 Star Trek: Discovery explores the implications of Saru’s recent realisation when a red burst appears over his home planet. As a new species in the Star Trek canon it was inevitable that audiences would eventually get a look at Saru’s home planet in order to develop his character through showing where he came from. Enterprise never got around to visiting Phlox’ home planet of Denobula but Discovery has made Saru’s background a priority. This follows on from him surviving what he believed to be a terminal condition in a recent episode and picks up the question of exactly how much he has changed following the loss of his threat ganglia. Episodes like this should be exactly what Star Trek is about. We have a strange new world with a way of life that is as yet understood, a crisis relating to that planet and messages about challenging the status quo as a method of growth. The episode delivers on those things but fails to scratch the surface of them. The attempted exploration of the Kelpiens as a species is a great example of the lack of depth. Outside of Saru and his sister Siranna (Hannah Spear) there are no other Kelpiens featured until the very end of the episode so we get no real sense of their culture outside of these two characters. There are attempts to mitigate that through Saru explaining how it all works but exposition almost always comes secondary to actually seeing that in action. 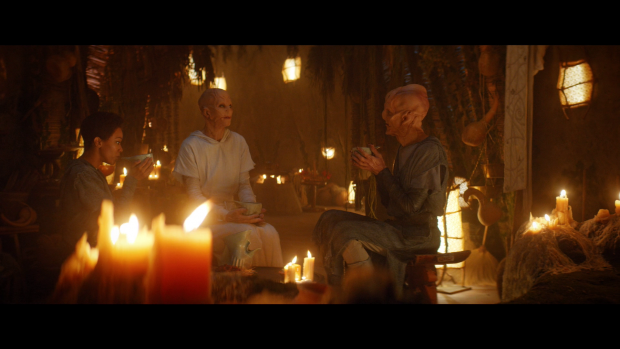 Arguably viewers could watch the short “The Brightest Star” which focuses on Saru and give some insight into how the Kelpiens function but this episode had the opportunity to do more with it. This is especially important given that the episode deals with a massive shift in the Kelpien way of life. Without context as to what that was like before the change is meaningless. There’s lots of talking about how the Ba’ul enslave them and the Kelpiens living in constant fear of experiencing the Vahar’ai but without actually seeing that the impact is limited. There have been many episodes of Star Trek where a character returns home in some way whether that be Worf serving on a Klingon ship or Spock undergoing the Pon farr and returning to Vulcan. In those particular cases the character the audience is familiar with is the window into that culture as they bring with them the values that viewers are familiar with which allows the writers to explore a situation that would otherwise be entirely alien to us. Saru could have served as that bridge for the audience as he fully believes in the Federation values and understands how far he’s come since leaving his home planet. Using him as a guide was the logical choice as he could have commented on how upsetting it is for him to watch his people suffer when he knows that they don’t have to. Instead we get some admittedly strong moments between Saru and Siranna that addresses him leaving without even saying goodbye to her and the impact that had on both of them. In Siranna’s case her brother’s disappearance inspired her to become the village priest in the hope that the light that took him away would someday respond to her. In effect she took the only action available to her in order to get her brother back. Saru recognises that he had a great life after leaving Kaminar full of opportunity but always regrets the unfinished nature to his relationship with Siranna. Being together again brings comfort to both of them as things are no longer unresolved. This example of reconciliation helps Burnham gain perspective on her own family situation and decide to deal with her own family issues. The truth about the Vahar’ai doesn’t come into play as significantly as it should. Saru is the personification of everything the Kelpien people could be without living in constant fear. The belief that they must sacrifice themselves once the Vahar’ai begins has held the Kelpiens back for thousands of years so more should have been made of what Saru learned. Triggering the Vahar’ai in all Kelpiens so that they automatically move beyond the dear based existence is an interesting idea in theory but completely butchered in its execution. The main issue I have with it is that the crew of Discovery make that decision for the Kelpiens which seems counter to the core Federation ideals. Arguably the Kelpiens deserve to know the truth but they should also be free to decide if they want this to be done to them or if they would rather experience it on their own at the right time. This approach is messy, morally questionable and completely devoid of nuance. I’m reminded of the TNG episode “First Contact” which ended with the realisation from the species Picard and his crew make contact with have been changed forever by knowledge but it’s up to them to decide what to do next with no external pressures. That should have been the case here as nobody except the Kelpiens have the right to make that decision. Even though Saru represents the people he has no way of knowing what forcing this on them means. He doesn’t even understand the extent of his own changes so really has no right to make that decision on behalf of his species. It would be the equivalent of me deciding that cigarettes should be completely banned because of the proven health risks. As a Human being it is arguably my responsibility to inform everyone of what I’ve learned but I have no right to make choices for anyone else. The same applies to Saru here. The Prime Directive is also a consideration. Pike decides to bend the rule as the Kelpiens have already made contact with a Warp capable species so technically the rule as written doesn’t stand. That’s a great example of it being a guiding principle open to interpretation. There is no doubt in my mind that the Prime Directive applies in deciding to force the entire species to go through the Vahar’ai. This is direct interference in the development of a species through an assumption that it’s what happens to be best for them. Once again, educating them was the logical solution here and then letting the Kelpiens decide what to do with it. Evidence exists within the episode proving how bad an idea this is. As soon as the Vahar’ai is forced on the Kelpiens the Ba’ul start a process that will wipe out the Kelpiens. They feel so threatened by the prospect of becoming Prey to a more evolved Kelpien species again that they are willing to commit genocide. 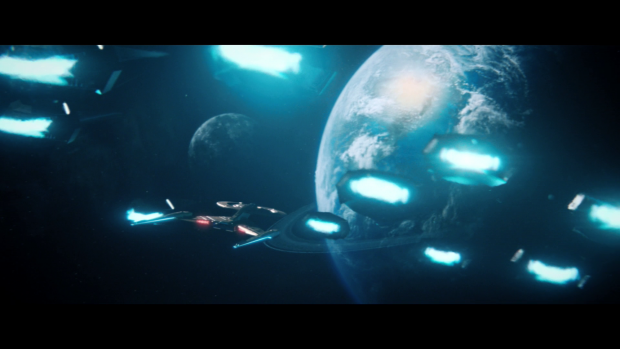 Discovery clearly doesn’t have the means to put a stop to this so it’s really fortunate that the Red Angel decides to intervene and stop the Kelpiens from being wiped out otherwise Pike might have had to write a fairly pessimistic report that Starfleet Command might take issue with. Amusingly, the Christopher Pike in Star Trek Into Darkness had issues with Kirk making decisions very similar to those made here though I do acknowledge that they’re different versions of the Pike character despite the similarities in personality. Saru sees the evolution of the Kelpiens as an opportunity to level the playing field between his people and the Ba’ul. They have been artificially made to live in fear for a long time as a control measure. The fact that they were once the predators with the Ba’ul being the prey is an interesting twist and the prospect of negotiation once the predator/prey dynamic has been neutralised is interesting as is the idea of a long history of misdirection motivated by fear on the Ba’ul’s part but the execution of this is equally problematic. Without devoting time to exploring the dynamic that exists between the two races any changes that are made have no meaning. A big part of the problem is that the Ba’ul are a pretty standard alien menace who make bold threats and try to be imposing but there’s nothing beneath the surface. It seemed obvious early on that they would turn out to be what Kelpiens become post Vahar’ai with the benefit of centuries of evolution but that’s apparently not the case despite making the most sense. As such they simply come across as a mysterious antagonist with no real threat level attached to them. Dialogue fleshes out their motivations but exposition is always less effective than taking the time to actually explore something. Despite that, the scene where Pike squares off against the Ba’ul is excellent because of Anson Mount’s performance. He always exudes such authority and confidence which makes it abundantly clear how skilled a Captain he is. At no point does he flinch in a high pressure situation and the quick fire precision of his orders shows how keen his instincts are. Anson Mount’s line delivery when talking about his willingness to defend Saru and later in the episode when he offers the Ba’ul an ultimatum is first rate. If this had been in a better episode with a stronger narrative then it would have been all the more impactful. The appearance of the Red Angel finally delivers some forward movement on this plot. It’s the best look at the entity we’ve seen so far using the detail of Saru’s enhanced vision to start to unravel the mystery. He sees that the Red Angel is Humanoid and wearing some sort of technologically based suit which definitely puts it in the camp of sufficiently advanced technology beyond the current understanding of the time. The appearance continues the suggestion that there is an agenda at play involving helping those who need it. In this case, Discovery is drawn to Kaminar in order to usher in a new balance between the Ba’ul and Kelpiens. I have issues with the execution of this plot but the idea is sound and backs up what has happened previously. There is also an interesting discussion about the motives of the Red Angel that makes good use of the characters present. Pike is the eternal optimist who believes that the Red Angel has proven its intentions are benevolent but Tyler is there to make the counter argument along the lines of not knowing enough to come to any conclusion. This discussion is a continuation of the core Federation values contrasting those of Section 31 represented through Pike and Tyler as per last week. The beauty of this discussion is that there’s no right answer as both parties come to reasonable conclusions based on their interpretation of the available evidence. 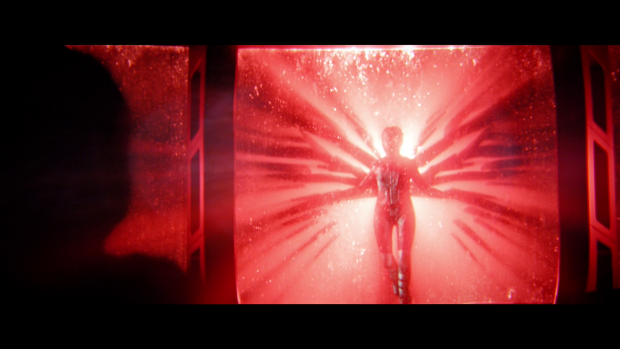 Tyler and Section 31’s concern is that the power the Red Angel has at its disposal could be turned against the Federation. There is no real reason to believe that this could never happen and it’s certainly a contingency worth preparing for considering how devastating this could be. The suggestion that the Red Angel is a time traveller altering the timeline for its own interests is also an interesting point worthy of exploration. Hopefully the momentum on this plot will be maintained. Burnham’s presence during the discussion isn’t necessarily required though having her act as something a mediator for the oppositional forces of Pike and Tyler works well enough. The return of Culber is something that exists in the background at this point without doing an awful lot with it. For now a reminder that he’s back and that there are consequences to it at least on an emotional level is enough. Culber having a brand new body sans a defining scar that Stamets decides to exposit about in exquisite detail. It’s a clumsy example of dialogue but Anthony Rapp manages to sell it and his performance when it comes to showing the happiness termed with concern around the return of the man he loves. Culber talks about not feeling like himself now that he has been reborn which could go in many different directions. It could develop along the lines of him “coming back wrong” or it may mean a massive shift from his character as he finds a way to redefine his life in some massive way. Having this connect to Saru having his own world turned upside down after recent revelations is both natural and compelling. A weak episode overall that has big ideas that it fails to give proper attention to. Saru’s recent change and the realisation that comes with it isn’t fed into the story in any meaningful way. The predator/prey dynamic between the Ba’ul and Kelpiens is superficial at best and the treatment of the next stage of the Kelpien evolution is handled in a really clumsy way especially in how it relates to the Federation values. There are fundamentally bad decisions made with nearly catastrophic consequences that aren’t directly addressed as being errors within the plot itself. Another issue is that Ba’ul are less than engaging as an antagonist as little effort is made to develop them. The episode does a good job of Saru and his sister Siranna’s relationship by giving it a satisfying resolution and using their history to inform the choices Siranna made in his absence. The appearance of the Red Angel finally moves this plot forward because Saru’s enhanced vision allows for a better look at it. It turns out that it’s a Humanoid in a tech suit which conclusively leans into the advanced technology that can’t be understood in the current time period. 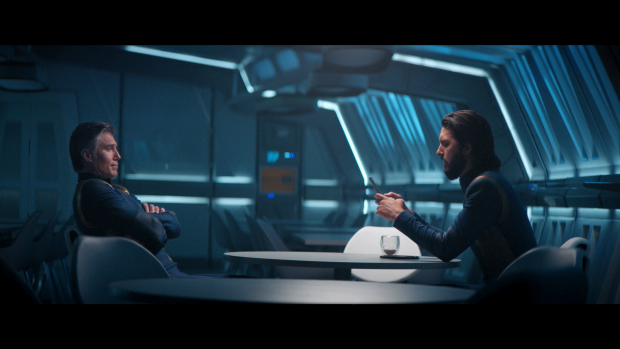 There is also a discussion between Pike and Tyler about the intentions of the Red Angel that continues the idea that Pike represents Federation ideals with Tyler representing Section 31’s outlook. Both sides have valid arguments and Burnham acting as the mediator works well enough. Hopefully the momentum of this mystery will be upheld. There are some great scenes involving Pike talking with the Ba’ul that make for a great showcase of his leadership skill as well as his effectiveness as a Captain. Culber being back is definitely a background plot for now but his presence serves as an effective reminder that there are consequences to his return and the idea that he doesn’t feel like himself any more leaves a lot of development possibilities. Anthony Rapp’s performance sells some clunky dialogue and the happiness tempered by caution felt by Stamets. Connecting Culber’s feelings to Saru and his current uncertainty is both natural and compelling.